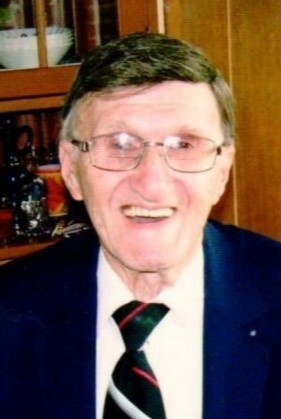 Elmer M. Horwath, 94 of Jefferson, passed away on Monday, April 1, 2019 at Sylvan Crossing of Jefferson. Elmer was born on September 22, 1924 in Milwaukee, WI, the son of Joseph and Eva (Ratz) Horwath. He attended Arrowhead High School in Hartland and Elmer served his country in the US Air Force as a test pilot. On May 12, 2012, Elmer married Christine Diane Brown. He loved cars, was a shrewd negotiator – loving a good deal, and was known for his honesty. He was a talented singer, enjoyed entertaining people, and even recorded some of his music in years past. Elmer was a people person and a servant of others. He enjoyed meeting and speaking to new people about the ministry work. Psalm 37:11 was a favorite passage of his and his family is resting in that truth. Elmer is survived by: his wife Christine Horwath of Jefferson; daughter Rita (Vincent) Bailey of Phoenix, AZ; 10 grandchildren, and 15 great-grandchildren. He is also survived by a number of other relatives and friends. He is preceded in death by his parents, children Eileen Rose and Reed Horwath, granddaughter Samara Brickman, and 2 brothers and a sister. A celebration of Elmer’s life will be held at a later date.